Relax your mind and body with the regular practice of yoga in Miami Beach. 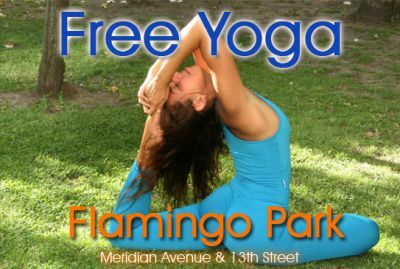 Every week, devoted yoga Miami Beach instructors offer free yoga classes for all levels at Flamingo Park Miami Beach sponsored by the City of Miami Beach. Achieve a feeling of invigoration and relaxation at the same time with the help of yoga classes Miami Beach. Relieve stress, clear your mind and learn how to regulate breathing and activate a feeling of serenity at the same time as you strengthen and tone your body. Just bring your own yoga mat or towel and a water bottle. Bring anyone to accompany you…even your pet! For more information please call Victoria Brunacci at (786) 444-1817.